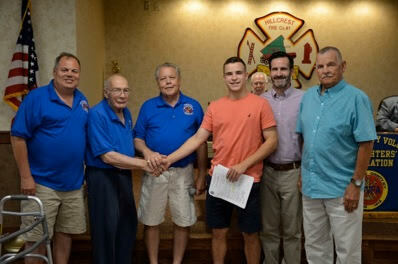 The Rockland County Volunteer Firefighters’ Association held its annual scholarship night July 13, 2018 by awarding three $1,500 scholarships at the Hillcrest firehouse on Route 45 in Hillcrest. The applicants had to be sons, daughters, grandsons or grandaughters of an RCVFA member. The scholarships are named for RCVFA past president Stuart Gates who presented the award along with Scholarship Chairman James Hartwick and Scholarship committee member John Coyle IV. Michael Csernecky of Thiells, a graduate of North Rockland high school who will be attending Florida State University this fall to pursue a doctor of Sports Medicine degree. He is a member of the National Honor Society, National Business Honor Society, National Math Honor Society and local Social Studies and English Honor Societies. He was a member of the Red Raiders football and lacrosse teams, and he captained the lacrosse team where he was all league. He was a member of Varsity Athletes Against Substance Abuse (VAASA) and volunteered for Meals on Wheals, Buddy Basketball, youth lacrosse coach and official. His father is William Csernecky, a former Chief of the West Haverstraw Fire Dept. (Volunteer Hose Co. 2) and RCVFA Life member who joined in 1970. Anastasia Leone of Blauvelt, a graduate of Tappan Zee high school who will be attending Penn State University this fall. She was a member of the National and Spanish Honor Societies and a Tutor Team member for four years. She was a member of VAASA and participated in gymnastics spring track and field and swimming. She earned All Section recognition in gymnastics three years and volunteered in Buddy Ball, ran in several fundraising events and attended a Brown University Pre-college study in Spain, a Columbia University Pre-college summer journalism program, and a Dominican College Public Speaking Academy. Her father is Christian Leone, a volunteer with the West Nyack Fire Dept. and a RCVFA member. Joanna Meyers of New City, a graduate of Clarkstown South high school who will be attending Rockland Community College this fall to study engineering. She was an early/dual enrolled student at RCC since the fall of 2017. A 13-year Girl Scout, she attained the GSA’s highest Gold Award, and also participated I Venture Scouting, a co-ed branch of the Boy Scouts of America and attended the BSA National Jamboree in West Virginia in 2017. She was a member of the National, Math and Italian Honor Societies, was a life guard at Camp Addisone Boyce (GSA) in Tomkins Cove for two years, A volunteer with the West Nyack Fire Dept., she presented an award-winning research paper this year at the Beacon Conference at Montgomery (Md.) College on post 9/11 skyscraper and firefighting technology. He father, Richard Meyers, is a former Chief of the West Nyack Fire Dept. and a RCVFA member since 1997. He accepted the award for Jeanna who is in England this summer.